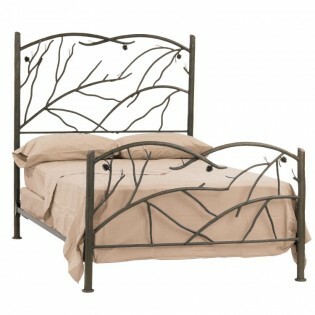 These hand forged Pine Cone Iron Beds are both beautiful and realistic. They carries the individual markings of the blacksmith artisan who created it, so no two beds are ever the same. They feature a realistic bark texture and finely detailed pine cones. Made in the USA. These hand forged Pine Cone Iron Beds are both beautiful and realistic. They carries the individual markings of the blacksmith artisan who created it, so no two beds are ever the same. They feature a realistic bark texture and finely detailed pine cones. These beds are featured in a Hand Rubbed Bronze finish which brings out the textures and features that make it such a work of art.